Economist Jean-Pierre Berlan and marxist geneticist Richard Lewontin reveal the politics and economics behind 1980s US agribusiness. The farm crisis that is so much in the news is not new, but is the culmination of the long process of the transformation of agriculture. This transformation is marked by an increasing penetration of large capital concentrations and an increasing differentiation between farming and agriculture. Farming is producing wheat; agriculture is turning phosphates into bread. Farming, carried out by millions of petty producers, is now completely dominated by the total system of agricultural production under the control of a few oligopolies, who sell farmers their inputs, and buy their outputs, and control (directly or indirectly) their conditions of production. This process of transformation has been made possible by, and has been driven by, agricultural research and technological change. Ironically, while public agricultural research responds to the demands of farmers, it is in the very process destroying their status as independent producers and putting them more and more under the control of capital. One hardly needs to be a Marxist to argue that technological change drives and is driven by commodity production. Indeed, it is a basic assumption of neoclassical economics that there is a constant pressure to introduce cost-saving technology. Moreover, the theory of "induced innovation," which has become trendy in economics in the last twenty years, argues that the detailed direction of deveopment of technology is not the result of an autonomous process of invention, depending only upon the "facts of nature" and the chance operation of individual genius, but is directly responsive to economic pressures. If the marginal cost of labor is high, then technological change will be driven to labor-saving innovation; while if energy is more costly, techniques of substituting labor for oil may result. It is also universally agreed that technological change is ultimately based upon "basic research" into the fundamental properties of the physical world. Discoveries in solid state physics were absolutely necessary for the computerization of the factory, the office, and the den; basic research into the structure of DNA made possible genetic engineering and built the fortunes of biologist entrepreneurs. The conventional picture of research and development is thus a two-stage model. Basic research, largely carried out in public institutions such as government laboratories and state universities, or in private universities and research foundations supported by public monies, is an autonomous cultural process based upon the desire to "unlock the secrets of nature." The direction of this research is dictated by the facts of nature and by the culturally conditioned desire of scientists to discover the most basic features of the natural world. Once these discoveries become available, they are picked up by the institutions of applied research, the applied government laboratories, corporate research centers, and individual inventive entprepreneurs, who develop specific new techniques to reduce actual production costs, to create new consumer products, or supposedly to serve the common good directly, for example, with new drugs. Small changes in the "production possibilities frontier" are allowed to occur, new products make their appearance, but the basic structure of production remains unchanged. In reality, however, this picture is ahistorical and relevant only to a world in equilibrium. The reality is quite different. Rather than being just another factor of production, research and development have transformed capitalist production by facilitating the penetration of capital into all aspects of the productive process. "Basic" research, far from being autonomous, is in a constant state of reciprocal interaction with social and productive exigencies. Partly, this is because the funding of "basic" research depends on the perception of its usefulness. While there is enough looseness in the system of funding to allow research workers considerable freedom to do what interests them (that is, what is regarded as interesting to the scientific discipline), most basic research is funded by tax money, with ultimate priorities being set politically. What is not usually understood is that, apart from the role that scientific knowledge may play in the eventual production of consumer goods, the products of research are themselves directly commodities. And because of the commodity nature of research, there is a powerful tendency for the perception of what is scientifically true and the direction of further research to be governed by the profit that can be directly realized from it. These two elements of research--that it is a tool for the penetration of capital, and that its commodity nature governs both its direction and perceptions of what is true about nature--are nowhere better illustrated than in agriculture. Agricultural research is marked by a major divergence between its justifying myths and its actuality. The myth is that the purpose of agricultural research is to better feed and clothe people by making production more efficient. This greater efficiency is supposed to have the side effects of making farmers, at least the progressive and efficient ones, better off economically and providing them with greater freedom from back-breaking toil. It is also usually claimed that "scientific agriculture" epitomizes the way in which a discovery of a "secret of nature" can rapidly transform the technique of production for the benefit of producers and consumers. Hybrid corn is held out by both scientists and economists as the paradigmatic example of basic scientific truth producing a major advance in productivity. In an accompanying article, "The Political Economy of Hybrid Corn," we show how "scientific truth" is in fact created by the commodity nature of research. At first sight, agriculture appears to be an exception to the general trend of capital penetration. Whereas almost all sectors of industry and services are concentrated among a few corporations, farming remains in the hands of 2.5 million petty producers. There is, of course, concentration within farming: the largest 6 percent of establishments produce 60 percent of the total value. But farm products are highly differentiated in value, and much of the concentration is accounted for by the production of high-value goods like fruits, tobacco, cotton, broilers, cattle, and hogs. Grain production (including soybeans) for both feed and human consumption, dairying, potatoes, etc., remain in the hands of large numbers of small producers. The historical trend to concentration in farming, as measured by the decrease in farm numbers (from 5.7 million in 1900 to 2.7 million in 1975) and by the increase in average acreage (from 146 to 404 in the same period), apparently supports the view that farming too is on its way to becoming strongly concentrated, but this is illusory. The proportion of farms in the hands of absentee corporate owners has remained less than 1 percent since 1900, and most of the increase in farm size is the result of acreage increases in medium-size farms that now consist of partly owned and partly rented acreage. The failure of farming to become oligopolized results partly from financial factors and partly from the physical nature of the farming process: (1) investment in farm land has low liquidity because the farm real estate market is thin; (2) farm land cannot be depreciated; (3) farming operations are spatially extensive, making control of the labor process difficult; (4) economies of scale are limited; (5) risks from weather and unforeseen epidemics cannot be controlled, or only poorly; (6) the cycle of reproduction of capital cannot be shortened because it is indissolubly linked to the annual crop cycle, or the reproductive cycle of cattle. As a result of these factors, sensible capitalists look elsewhere for investment opportunities, though there are exceptions that support the rule. Very large plantations, for example in sugar, or extensive cattle ranches are based on immense tracts of land acquired at little or not cost in the eighteenth century by Spanish land grants, or in the nineteenth by the occupancy of "unoccupied land" (i.e., by the forcible displacement of indigenous people) in the West and Hawaii. Agriculture in these circumstances is the valorization of a free asset. The other exceptions, the ones that are directly relevant to the question of research, are typified by the poultry broiler industry. Because of the physical nature of broiler production, it requires little land: the birds can be packed into factory-like batteries with a high degree of automation. The environment of production can be rigorously controlled (for both human and animal!). The cycle of reproduction of capital can be speeded up by accelerating the growth of birds through nutrition and breeding. Large economies of scale can be realized in the purchase of inputs, automation, and bulk sales to a few large customers, such as fast-food chains and supermarkets. The consequence has been the creation of a new industry characterized by vertical integration. Large firms have contracted with marginal farmers in the South--on the one hand, to provide them with all their inputs, including buildings, machinery, feed, antibiotics, breeding stock, etc., and, on the other hand, to buy the mature birds at the going market price, slaughter, dress, and distribute them. Thus the farmer is placed on the assembly line of the agricultural factory, put without any of the benefits (fixed monthly salary, disability, pension, etc.) that labor has been able to acquire through organization. The same process is now taking place in hog production, which has similar physical possibilities. These explanations of why farming, except in special cases, seems immune to the penetration of capital take in only part of the picture, however. It is here that the distinction between farming and agriculture becomes indispensable. Farming is the process of turning inputs like seed, fertilizer, pesticides, and water into primary products like potatoes, corn, and cattle on a specific site, the farm. Agriculture, while it includes farming, is much more. It also encompasses the production, transportation, and marketing of inputs, and the transportation, processing, and marketing of farm products to convert them to consumer commodities. When the entire agricultural process is considered, it becomes clear that capital has indeed completely penetrated it. While farmers occupy a physically indispensable link in the chain of agricultural production, and at this stage the productive process is spread over a very large number of petty producers, the control of the conditions of production and the bulk of agricultural profits belong to a small number of large capital concentrations. Technological change has played the same role in capital concentration here as it has in all other productive sectors. Agricultural research and technological change, while ostensibly serving the needs of farmers and consumers, is in fact molded by the demands of capital and acts as an automatic agent of capital in determining the nature of farming. A major claim of the agricultural research establishment is that research has resulted in major changes in productivity, measured as the total value of farm outputs divided by the total value of farm inputs. In part, however, the productivity increase (from 53 in 1910 to 113 in 1975 [1967=100]) is a consequence of changes in factor prices, the causes of which lie outside farming itself (for example, the sudden availability of cheap fertilizer after 1946). Moreover, there have been major changes in the nature of farm inputs. From 1910 to 1975, the index value of inputs produced directly on the farm dropped from 175 to 90, while the index of purchased inputs rose from 38 to 105 (1967=100). In other words, the ratio of purchased to self-generated inputs increased more than 500 percent, despite the fact that a major input, land, has remained a constant self-generated input in the calculation! What this means is that the farmer has been changed from a primary producer into an intermediate converter of manufactured goods. In 1910 farmers gathered their own seeds from last year's crop, raised the mules and horses that provided traction power, fed them on hay and grains produced on the farm, and fertilized the fields with the manure they produced. In 1986 farmers purchase their seed from Pioneer Hybrid Seed Co., buy their "mules" from the Ford Motor Company, the "oats" for their "mules" from Exon, their "manure" from American Cyanamid, feed their hogs on concentrated grain from Central Soya, and sow their next corn crop with the help of a revolving loan from Continental Illinois Bank and Trust Co. Moreover, these purchased inputs are tightly linked to each other technically. Farming has thus become a more and more capital-intensive sector of production. The decline in farm employment (both relative and absolute) has not meant a loss in employment in agriculture, however, since there has been a large increase in the number of workers who manufacture, service, supply, repair, transport, and transform farm inputs and farm outputs. Like physical inputs, agricultural labor has been transformed from a petty-producer, semi-autonomous mode to one dominated by large capital concentrations. It is not only on the input side that agriculture has changed. Agricultural commodities are increasingly the objects of transformation after leaving the farm gate. Fast foods, processed foods, reconstituted foods, frozen foods, enriched foods, and extracted foods are pressed, shaped, colored, flavored, wrapped, and transported. A consequence is that 50 percent of the average value added in agriculture is added after the product leaves the farm. An additional 40 percent is accounted for by farm inputs, so that farming itself, while physically essential, adds only 10 percent of the total value of agricultural production. The transformation of agriculture from petty production to the capital-intensive production of inputs and processing of outputs has been mediated throughout by technological innovation and research. The first step was the introduction in the nineteenth century of farm machinery: the steel plow, the reapers invented in the 1830s, the combine, and the stationary steam engine. All of these were a direct response to the demand of farms to reduce labor costs and better control the labor process. Labor efficiency in grain production increased by two to three times; and in favorable conditions of harvesting, the complete combine cut labor demand by a factor of eight. This phase of technological change ended around the turn of the century because of limitations in traction power. The size of gang plows and harvesting machinery that could be drawn by draft animals was limited, and stationary steam power still had to be supplied with materials by labor-intensive transport. The second major phase was created by the development of flexible, maneuverable traction: the internal combustion engine, the differential, the pneumatic tire. Between 1918 and 1945, farm machinery horsepower increased eighteen times. One of the major consequences of this mechanization was the freeing up of the 28 percent of crop land formerly used to grow feed for draft animals. This intensified an underlying tendency toward overproduction which reached unmanageable proportions in the 1930s. Farmers had to find a cash crop to replace oats previously consumed by their draft animals, preferably a legume capable of renewing the fertility of the soil, since now manure from draft animals was not available. Soybeans proved the perfect answer, not only to the short-term objective of providing an alternative crop but as a macroeconomic solution to the problem of overproduction. Soybeans triggered a major shift to animal production (cattle, hogs, and poultry) for meat, and the corn-soybean model came to dominate much of world capitalist agriculture. Soybean concentrate made meat production more "efficient," because a dramatic decline in the ratio of feed consumed to weight gained meant much faster growth and leaner meat. Feed thus became a commodity and its production an industry. Since the concentrated feed provided a more "efficient"--in the narrower, microeconomic sense--ration, the new industry pioneered the development of vertical integration, whereby farmers maintained their apparent status as independent producers, only to be exploited as the independent weavers were under the putting-out system. Public research and development work had to be done at each step of these transformations: engineering the soybean plant from a Chinese noncapitalist vegetable to a capitalist high yielder of protein; technological changes turning the soybean oil into a stable, bland raw material for the margarine and oil industry; and thousands of nutrition trials to devise rations precisely adapted to the "needs" of animals--that is to say, the needs of capital. The enormous increase in the consumption of meat and other animal products that took place in developing countries from the war to the mid-1970s is generally considered to be the response to a universal desire for meat and better diets. In fact, this socially wasteful change of dietary habits was a response to the overproduction crisis triggered by the capitalist transformation of agriculture. The third major phase of innovation, following the Second World War, was the introduction of chemical technology: artificial fertilizers, pesticides like DDT, and herbicides. In fact, chemical treatment is now replacing machinery in the form of "no-till" agriculture in which there is neither plowing nor cultivating. Seeds are punched directly into the ground and sprayed liberally with herbicides to prevent competition from weeds. Agricultural research as an institutional phenomenon at first played little role in technological change. The nineteenth-century introduction of farm machinery was not the product of science, but of entrepreneurial inventors like McCormick. Moreover, there were scores of competitors, each with their own designs. The tractor was essentially the product of the automobile industry, and the immense increase in the use of chemical fertilizers was largely a result of conditions created by the Second World War, which generated a huge demand for agricultural products in Europe and at the same time created, at government expense, a large plant capacity for the production of low-cost nitrogen for explosives. The beginning of organized scientific agricultural research in the United States at Yale and Harvard in the 1870s stemmed essentially from the transplanting of Justus Liebig's agricultural chemistry from Germany. The State Agricultural Experiment Station system was funded in 1887 by the Hatch Act, but early research carried out under the system had no major impact on the direction of technological change. In the last seventy-five years, however, this system of research has taken on an increasingly important role in technological change, but of a kind quite different from the machinery, traction power, and chemical revolutions created by entrepreneurial capital. The research establishment has accepted these major changes as laying the foundation for agricultural technology and has devoted itself to the elaboration and perfection of these technologies, creating in the process the current articulated system of agricultural production. In other words, scientific agricultural research has been responsible for converting separate technological innovations into a system of production totally dominated by capital. One of the major pathways leading to this result involved extensive research in plant and animal breeding. The living organisms are both the products of farming and at the same time the means whereby inputs are converted into outputs. The realization that the efficiency of transforming inputs into outputs depends on the characteristics of living organisms, and that these characteristics can be manipulated genetically, is the major theoretical contribution of scientific agricultural research to the process of technological change and to capital penetration. For this reason we have, as already noted, devoted a separate article to the most famous case of breeding, hybrid corn. Agricultural research is carried out in both the public and private sectors. Public institutions serve two important functions. First, they can coordinate research on many different aspects of the same problem, while private entrepreneurs concentrate only on machinery or seed or chemicals, depending upon their particular commercial interest. So, for example, the successful introduction of the mechanical tomato harvester required, in addition to the development of a machine, a complete remaking of the tomato plant itself so that all fruits would ripen simultaneously, there would be a single central stem, and the fruits would be tough enough to withstand the rough treatment of the harvester. Such an integrated program required the coordination that only the California State Experiment Station could provide. Second, the costs of long-term research must be socialized because no individual firm will take the risk, or will commit unrecompensed capital for the ten or twenty years that may be needed for a new development. The structure of agricultural experiment stations responds to this need. The stations are divided into departments of plant breeding, plant pathology, soil science, weed science, animal husbandry, etc., each of which sets a research program partly in cooperation with others. Problems for solution are generated almost entirely by demands from "progressive" (i.e., large) farmers, either through their contacts with agricultural extension workers or through commodity producer groups that meet with and lobby research workers, department heads, and deans, or, more rarely, by requests from state legislators who represent farm constituencies. There are certainly occasions when input producers will offer small grants of so-called seed money to interest research workers in a problem, and these exert a leverage out of proportion to their actual amount--usually about 5 percent of research expenditures in a typical experiment station--because they represent disposable funds for the experimenter (as opposed to salaries, equipment, and administrative expenses). Nevertheless, it is clear that producers of inputs and transformers of outputs do not plya a major direct role in determining the direction of agricultural research. In an everyday sense, agricultural research is directed by the demands of larger farms and farm producer groups. And these demands, in turn, are set by the system of production in which farmers find themselves and which in the final analysis have been created by the actions of the research establishment itself. Farmers require the chemical control of an insect that has become a pest because all the weeds that formerly drew it off have been killed by herbicides, which have been introduced to make mechanical cultivation unnecessary for the densely planted crops, the density of which increases because the plants have been bred to thrive under high densities, because they make excellent use of large applications of nitrogen, making the plants particularly attractive to the insects, and so on. And of course all of this requires capital to purchase special seed, herbicide, fertilizer, mechanical harvesters, and planters. A second feature of the farmers' demands is their concentration on the problem of labor. From the introduction of the reaper in 1831 (long before the famous Civil War labor shortage) to the creation of the mechanized tomato harvester and current research on the mechanized tomato grader and sorter, a major preoccupation of agricultural research has been the labor process. The problem has been not simply to reduce the wage bill, but to facilitate control of the process itself, particularly at the crucial harvest time. Harvesting, as a technical operation, cannot be postponed except at great risk; it requires in most cases a large amount of labor for a short period of time. Before the introduction of the reaper, harvesting wheat required three-quarters of the total yearly labor time. This is still true today for most fruit and vegetable crops. The result is the need for a large migrant labor force at harvest time, and the consequent vulnerability of the farm owner to labor organizers and the threat of strikes. (1) The maximization of foreign exchange earnings. Thus, available research is carried out on high-value crops for the European market: flowers, avocados, fancy citrus, luxury commodities that are largely ignored in the U.S. system. (2) Water is a strategic resource. A variety of water conservation techniques, including trickle irrigation and direct root irrigation, are Israeli inventions. (3) Oil is also a strategic resource. In the place of oil-based chemicals to control weekds and disease, mulches have been developed to heat and sterilize the soil. Biological pest control is emphasized. (4) Settlement of the land by the Jewish population is strategic. As a result, half of the agricultural research budget is devoted to the Southern Lands Project so that the Negev can be successfully settled and defended. (5) Jewish self-labor and the exclusion of Arab wage workers is both an ideological and a strategic goal. Technologies must be such as to encourage Jewish farmers and their families to carry out all the labor of farming to avoid dependence on Arab labor. This policy has not suceeded, however, because it is in contradiction with the first goal, high-value crops often being labor-intensive. (6) Jewish farm settlement is favored over Arab farming. Traditional Arab crops, as for example onions, are given low priority, and in general the Arab farming population cannot count on the research and extension establishment to futher its interests. Thus, the penetration of capital is not an inevitable result of research but arises when the commodity nature of production completely dominates to the exclusion of all other considerations. Despite the claim that the ultimate beneficiaries of agricultural research are the farmer and the consumer, neither is in fact helped. Certainly the farmer has not benefited. Between 1910 and 1977, average farm debt rose from $800 to $37,000 ($13,000 in 1910 dollars). The debt per acre grew from $3.50 to $91.00, but the price of farmland rose only by a factor of 10, so debt rose from 13 percent to 23 percent of real costs. In 1910 farm expenses were 48 percent of gross receipts; at present they are over 70 percent, so that the risk factor is much greater and the number of farm bankruptcies has greatly increased. Because of the thin market in agricultural land, farmers find it difficult to cash in on the inflation of land values, and there may be an unmanageable family liability at inheritance time. Net farm income in real dollars has increased by 2.5 times since 1910, but much if not all of this reflects the elimination of the poorest sector of tenants and sharecroppers. Nor has the consumer benefited from research. Food has not become relatively cheaper but in fact has risen more rapidly in price since 1930 than the average of all goods and services: food prices have risen 2.48 times, all goods and services only 2.33 times. And it is easy to see why this is so. The major effect of research aimed at increasing farm productivity has been to make this very factor of productivity less and less important as a determinant of the value of the final product, since so little of this value is now added on the farm. A loaf of bread today costs about $1.10 at the supermarket, while at current wheat prices, the grain in a loaf of bread has a gross value to the farmer of $.05! Suppose that a superior variety of wheat is created that increases production per acre by a remarkable 20 percent, and suppose further that this increase is a free good that requires no further inputs of fertilizer, labor, and machinery to realize it (an absurd assumption, but one widely made by plant breeders). Finally, suppose that the milling and baking industry passes the entire difference on as a saving in the price of grain--a no less absurd assumption. The loaf of bread would then cost $1.09. On the other hand, there is little doubt that the suppliers of farm inputs and the purchasers of outputs have reaped immense gains. Seed companies have the highest rate of return on invested capital of any productive industry, approached only by pharmaceutical firms, which explains why the latter have recently bought up many of the former. Farm machinery companies are in difficulty, because machinery inputs have been replaced by chemicals and because the farm crisis has forced farmers to postpone capital purchases. Chemical firms, including chemical/pharmaceutical combinations, have reaped enormous profits. 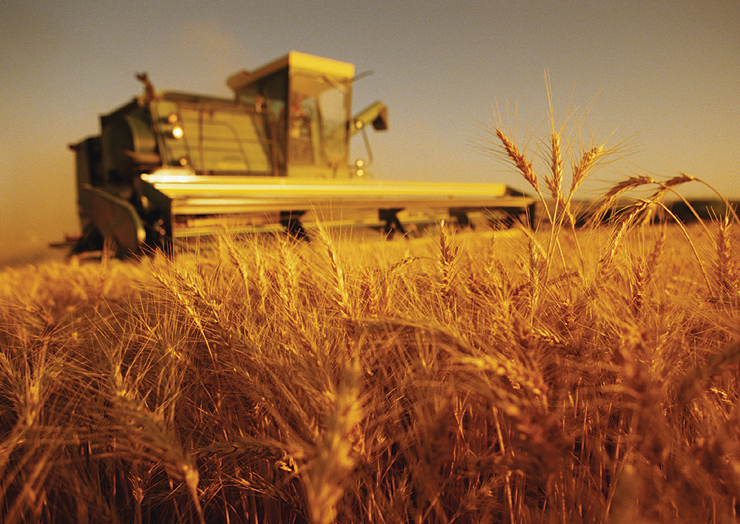 On the side of the purchasers of farm outputs, there has been a huge growth in grain companies like Cargill, which have also entered the seed production business, and transportation firms and food processing enterprises like Hunt and Campbell, which directly control farm production and have benefitted directly from mechanization research. Agricultural research, while it responds to the proximate demands of farmers, actually serves the needs of capital. Farmers are only the carriers of messages written in corporate headquarters. The anarchy of capitalist production is mirrored in the anarchy of agricultural research production. By demanding local relief from the immediate contradicitons of the system of production that has ensnared them, farmers further increase the penetration of capital. Like the sewed-on hand in Arthur Train's novel, that choked its recipient because it was under the control of its former owner, the invisible hand is at the farmer's throat and with every spasm it unwittingly tightens its grip.